Our products are manufactured in Vancouver, BC, Canada at a small factory that’s just a 10-minute drive from my house. I visit the factory often during production and I’m very happy with the professional workmanship and quality of the finished products. I try to use local suppliers where possible and as a result support many other small, local businesses. I needed a carrier cover to keep the snow off the baby. I live in Vancouver, BC, Canada with my husband and two daughters (born in June 2014 and June 2016). When I made my first baby carrier cover I didn’t intend to start a business, I just wanted my baby to be warm and dry. My daughter loved to be carried when she was a baby so I used my baby carrier a lot. Once the weather started to get colder I found that I needed a baby carrier cover – both for walking around the city and for playing in the mountains (as we’re determined to maintain some of our pre-baby lifestyle!). 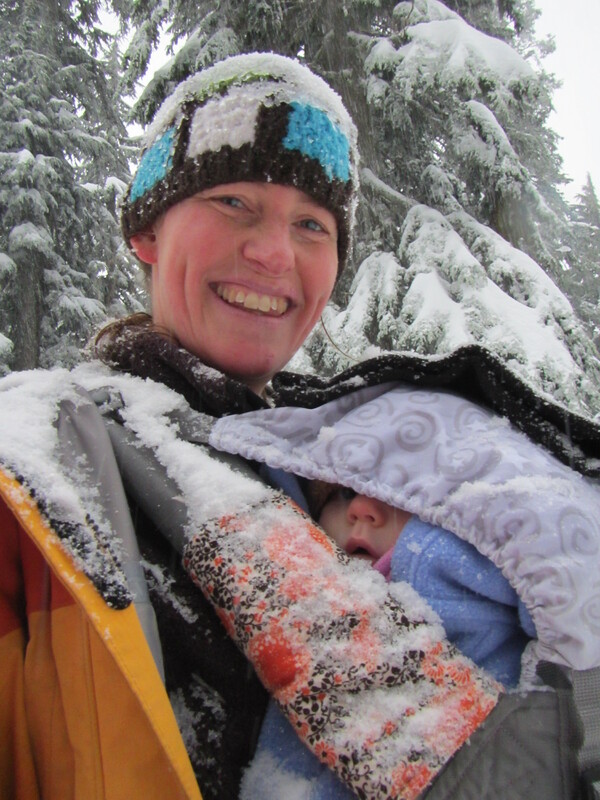 On our first snowshoeing trip the baby carrier had gotten covered in snow and, although the baby stayed warm and dry under many layers of clothing, I wanted a better solution. I’ve always enjoyed designing and sewing so I set out to make myself a cover. Then the reality of trying to accomplish anything extra with a young baby set in and I feared that winter would be over before my project was complete. (I even tried sewing with my daughter in the carrier once but the inconsistent rhythm of the sewing machine woke her up!) I had a look around at what was available and wasn’t completely happy with any of the options, so I kept sewing. I wanted it to be wide at the bottom so my daughter’s feet could dangle and move freely when she was sitting in an ergonomic frog-legged position. I wanted it to attach quickly and easily to the baby carrier, not over my head or around my body. I wanted to be able to use it with any jacket I was wearing and I wanted my husband to be able to use it too. I wanted the liner to be removable so I could still use it in rainy weather in the spring and fall without my baby (or me!) overheating. I wanted a cozy pocket for my hands because sometimes mittens are forgotten or taken off and on a lot to deal with little baby things. I wanted a hood that had a way of securing to the carrier so it didn’t get blown around. Plus I wanted it to be versatile so I could use it with my stroller too … or on the car seat or even my bike seat. After making and using this 3-season baby carrier cover I got so many positive comments and questions about where I got it that I decided to start making them as a business so other parents and their babies could enjoy the outdoors together too – even when it’s windy, rainy or snowy. I had already made myself a pair of teething pads and since I was starting a business I decided to make more of those too. I wanted my teething pads to be made of a fun print that appealed to me (my first pair was made from leftover material from a dress I made) and I wanted them to have a layer to absorb moisture as well as a waterproof backing. While my daughter was teething, the teething pads got really wet! Why the name Little Goat? Because I love goats! Once upon a time I milked goats in France for a summer and fell in love with the curious creatures.